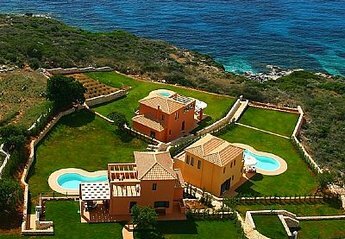 The Ionian Islands have some of the most desirable Villas and holiday rental properties. Corfu, Kefalonia and Zakynthos are some of the regions that make up the Ionian Islands. 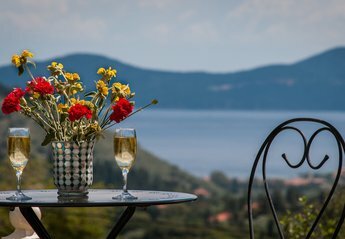 With very warm weather and stunning scenes Villas in The Ionian Islands and Apartments in The Ionian islands have never looked so picturesque. There are also many charming bar, pubs and restaurants to dine in. A true taste of Greece. 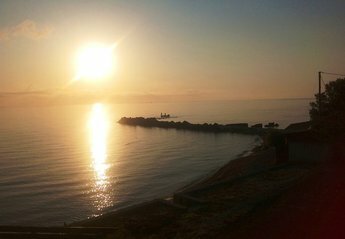 Found 209 holiday rentals in Ionian Islands. Exclusive spacious five bedroom villa set in idyllic surroundings, close to many beaches and amenities. 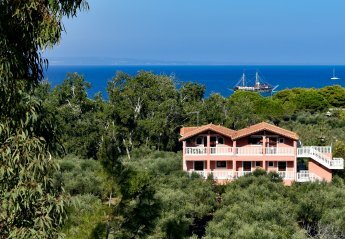 This holiday complex of luxury villas is set in the peaceful Kalamaki countryside amongst the olive groves. Kalamaki Court One bedroom villa with Free WiFi internet. 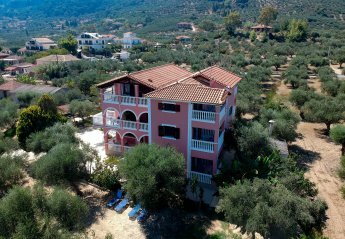 This private holiday complex of luxury townhouse/apartments is set in the Kalamaki olivegroves and countryside and yet only a 10 minute walk to the resort and long sandy beach of Kalamaki. 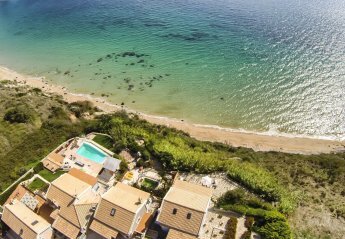 Within a smart complex of three seafront villas, a newly built self-catered property with private pool and direct access to the sea, just two kilometres to Skala beach and village. 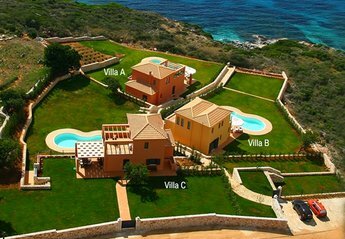 Smart villa with private swimming pool in newly built complex, close to all local amenities, and with direct access to the sea. Apartment within a villa set in idyllic gated grounds with a private swimming pool. 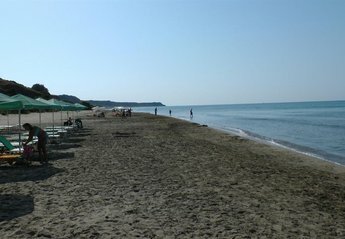 Close to many beautiful beaches, surrounded by fruit groves with wonderful views of Mount Aenos. Beautiful 2 Bedroom Villa with Private Swimming Pool and located in a quiet area but within short walking distance to the nearest beach and resort. New for 2015 at villa WiFi Internet also. 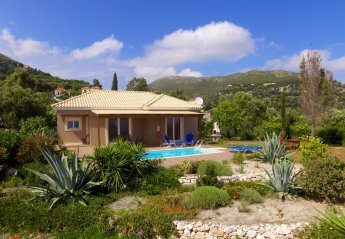 Self catering, fully air-conditioned villa with private swimming pool in Zakynthos. Perfectly situated, Sea View Villa is ideal for families and couples. Breath taking views, high quality property offering peace and tranquillity and within 5 minute walking distance to the beach. Grand and stylish villa with private swimming pool and surrounding garden. Full equipped and really spacious, situated close to all amenities, two kilometres from the beach. Fantastic views of mountains and the sea from this beautifully-designed, chic modern villa. Stunning both inside and out. Contemporary, comfortable and high-spec villa with a beautiful outdoor space including outdoor dining area and private pool. Fantastic views of mountains and the sea. Bright and roomy villa with stunning views across the countryside to the sea from throughout the property and its terraced garden. Fully equipped, and ideally located close to all amenities. Exceptionally impressive villa with everything you could expect from a luxurious modern holiday rental, and more. Stylish interior, all mod-cons and facilities, and incredible sea views. Charming villa in beautiful setting. Spacious, well appointed, in a quiet location with breath-taking sea views. Incredible views across the sea from this very well-located villa. Generous size, tastefully furnished and decorated with a lovely terrace and pool area. Chic and charming property with fabulous views reaching towards the sea. Roomy, bright and well-equipped, with a super, sun-drenched terrace and pool. 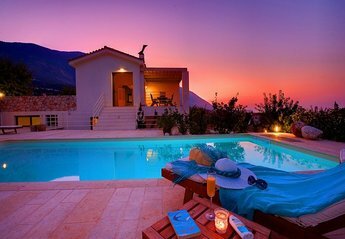 The stunning island villa you have always wanted, situated in lush green surroundings in a quiet Kefalonian village, with incredible sea views. A newly built self-catered property within a smart complex of three seafront villas. 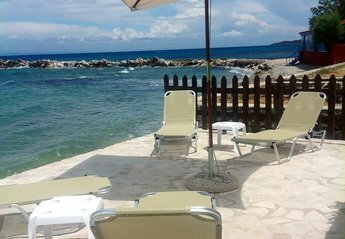 Private pool and direct access to the sea, just two kilometres to Skala beach and village. Stunning 2 bedroom seafront villa with the sea practically in one's garden! Stunning two bedroom seafront modern villa with the sea practically in one's garden! Romantic boutique villa, with breath-taking panoramic views, situated in a beautiful little town called Lakithra. Exceptionally beautiful gardens, with roses and olive trees. We provide two perfectly cleaned villas 100 m2 each. Ground floor is living room, kitchen and bathroom and in first floor 3 bedrooms and 3 bathrooms. 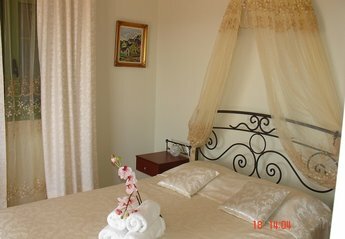 Each villa accommodates 6 persons. The best choice for families looking for an inspiring summer holidays Few steps from the sea shore our property offers a truly unique holiday experience. Incredible sea views from this modern, spacious villa, positioned on a hillside. Close to all amenities. 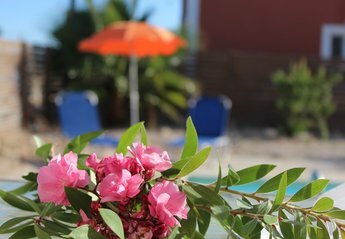 Villa Ippocampos is a two bedroom villa with a private swimming pool and surrounding garden! Fully equipped and really spacious, ready to cater your every need on your holidays. 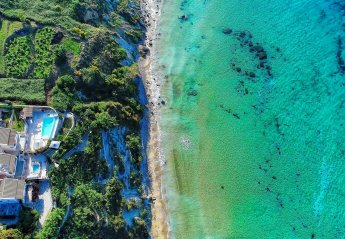 Luxury Beach Villa Angelo overlooks the perfect blue Ionian sea and is perfect for small families or two couples, featured is a private Canadian Hot-tub/Jacuzzi and access to our own secluded beach . We provide an apartment cleaned 100 m2 . Ground floor is living room, kitchen and bathroom and in first floor 6 bedrooms and 6 bathrooms. Villa accommodates 14 persons. Palazzo Di P welcomes you to Zakynthos. 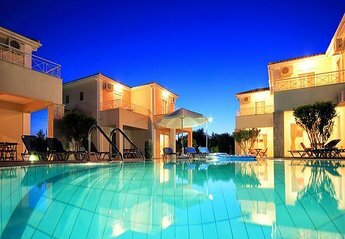 A luxury villa in in one of the most charming and lively areas of Zante Island. Superb, fully-equipped villa designed with home comforts in mind, in great location, just five hundred metres from the protected 'Turtle Beach'. 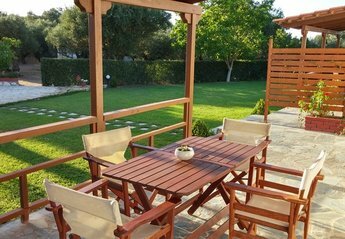 Split-level villa with a spacious, stone-paved courtyard overlooking the garden and the surrounding area, suitable for families, couples, pets. Traditional Luxury Villa Regina with private pool, spacius garden & children's playground, built in the countryside within a beautiful 2.500m² private property, completed in Spring 2014. Sea view attractive house with Jacuzzi, close to nature and sandy beach with a swimming pool, BBQ, playground free WiFi internet, perfect for couple, family with children unforgettable vacation. Ideales Resort consists of 12 luxurious villas with private swimming pools. The deluxe 2 bedroom villa Petalida has wide spaces and a blend of modern refined and functional decoration. 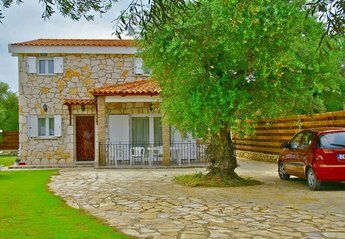 Peaceful villa in a natural landscape of olive groves above the south coast between Lourdas and Katelios. Dramatic sea views from this memorable holiday destination. 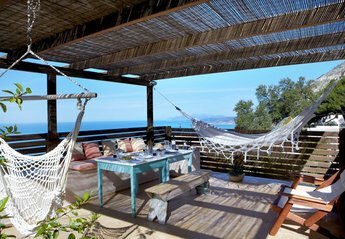 Set in the hillside amongst olive groves, this tranquil villa is located on the island's south coast between Lourdas and Katelios. Breath-taking sea views from the balcony, terrace and swimming pool. 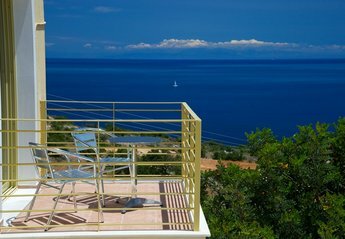 Beautifully decorated, exclusive villa, overlooking to bright blue Ionian sea and small island Zeus (named after the Greek God) which is occupied by a solitary chapel. Fantastic garden and pool. 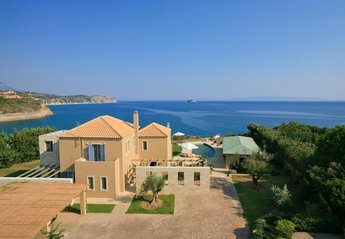 Villa Sophia is located on the lovely Greek Island of Zakynthos, set in an area called Varres which is on the outskirts of the lovely resort & beautiful sandy beach of Tsilivi. Arazzo Seaside Apartments for every need. 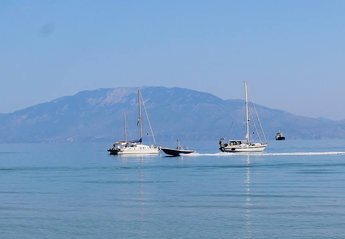 The panoramic view of our accommodation with the beautiful surroundings and the lush vegetation of the Island of Zakynthos makes it the ideal place for a relaxing and comfortable holiday. Beautiful holiday villa, private swimming pool, & within walking distance sea Detached private villa, Villa Christine has its own private pool set in spacious enclosed grounds & garden. 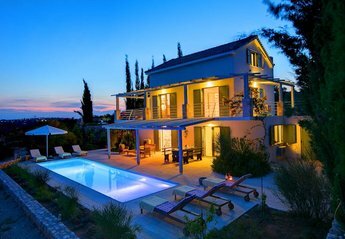 Villa Erato in Paxos island, just 5 minutes walking from the beach and the traditional seaside village of Loggos. Luxury villa, 110 sq. meters with 2 bedrooms, 3 bathrooms,big lounge,dinning room, full quipped kitchen, private swimming pool, big verandas with exterior furniture an sun beds . 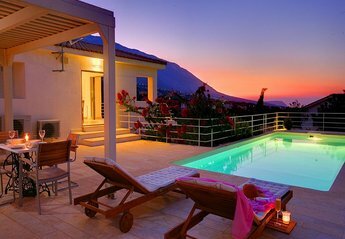 We found 209 holiday rentals in Ionian Islands.